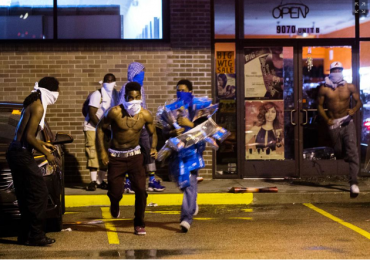 Looters smashed windows and stole goods from at least three stores — and threatened reporters, calling them police spies. Gov. Nixon is in on the scene and trying to keep things calm. A peaceful protest is planned for noon Saturday to mark the one-week anniversary of the day Ferguson Officer Darren Wilson shot and killed an unarmed teenager, 18-year-old Michael Brown. via Chaos erupts in Ferguson after day of relative calm among Michael Brown shooting demonstrators – NY Daily News. This yet another instance of seemingly obvious police misconduct and plain murder. In the last month we've had repeated acts of unnecessary violence perpetrated upon unarmed civilians. Yet they have all been caught on video? is this some kind of social test or do the po-lice just not give a f**k anymore? If they ever did?